This is my third time travelling to Bangkok. Although it was a short vacation however, it was a fulfilling trip as I went to a few places that not many tourists had gone to. 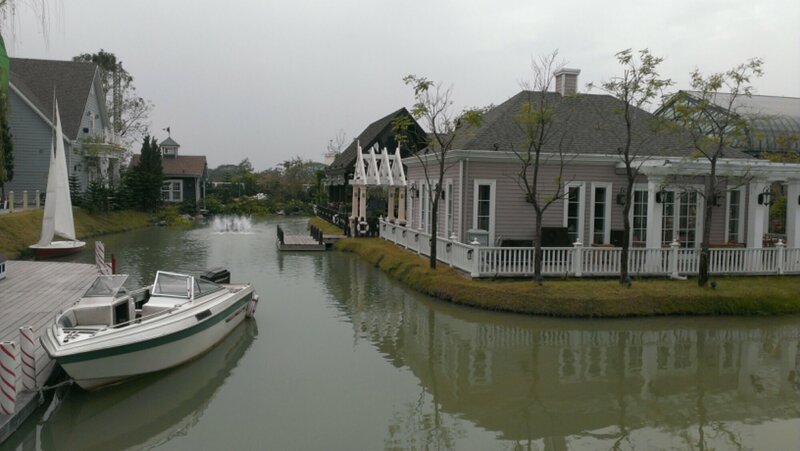 We went to explore the inner Bangkok for 3 days 2 nights between 21 and 23 Feb 2014. It was a planned trip since Dec 2013. 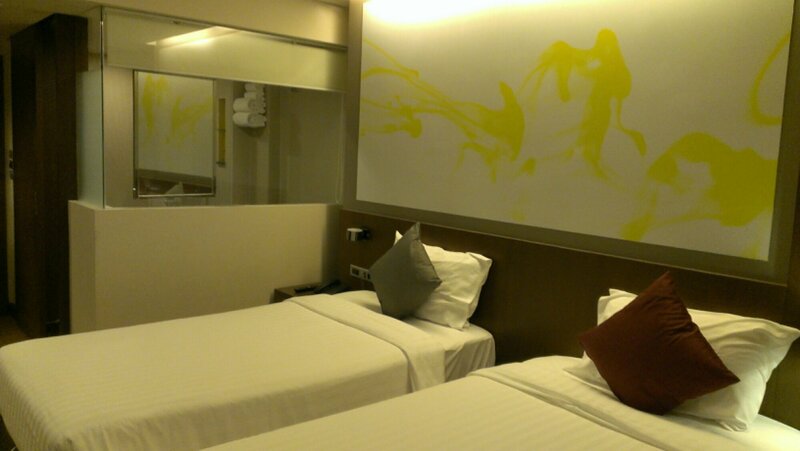 We booked the Jetstar air tickets and accommodation as well which is located at the central Bangkok. But we were indecisive of whether should we proceed our plans to Bangkok when the protests were started in many areas in Bangkok since January 2014. Change of flight tickets was a problem because Jetstar would incur S$100 two ways for postpone flight details. Hence two persons would incur charges of S$200! We decided to go on as planned as the penalty by Jetstar was too expensive, we might as well use the money on accommodation and to stay further away from the protest areas. We monitored the situation in Bangkok every day. The situation became bad to worse. There were bombings happened in many parts in Bangkok. Due to this we stayed further from Bangkok central still with easy access via BTS station. 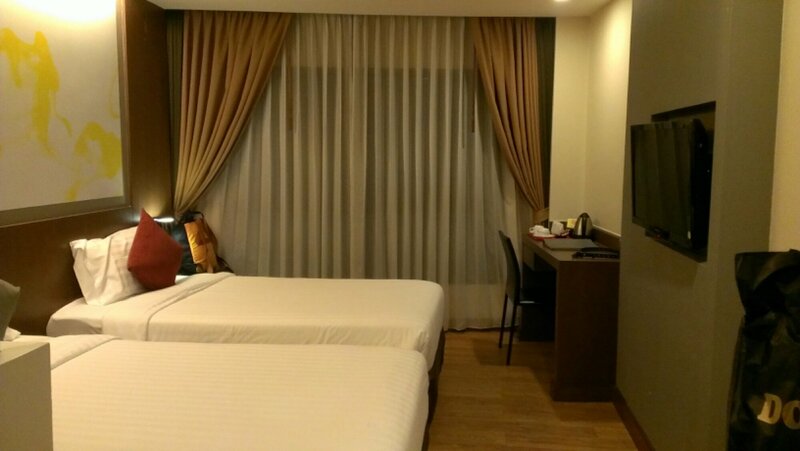 We booked 31 Suite Boutique hotel near Phrom Pong BTS which is one station away from the protest site, Asok. We are happy with the hotel. 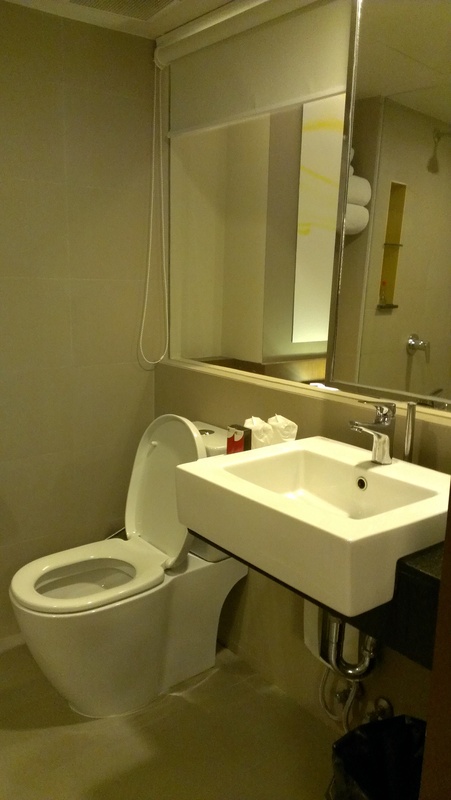 The hotel is considered a budget hotel with essential room and hotel facilities. It was a pleasant comfortable stay for two nights. This itinerary trip was to stay away from the Bangkok city. This was our 3rd trip to Bangkok within 2 years. 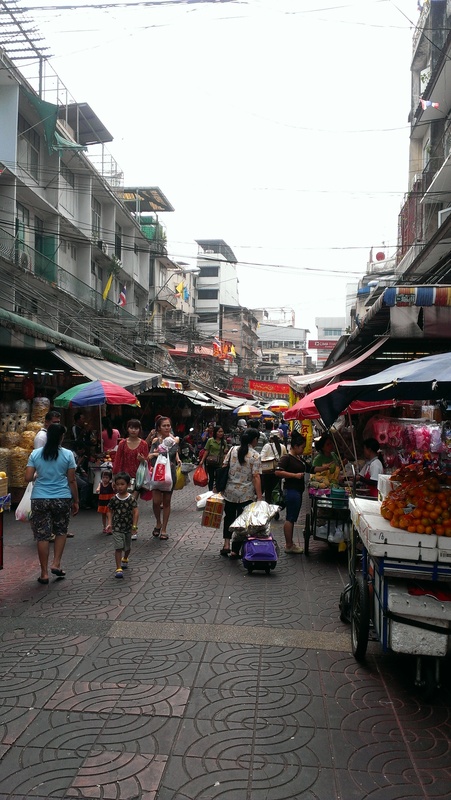 Our last trip, we did not visit Chatuchak market. 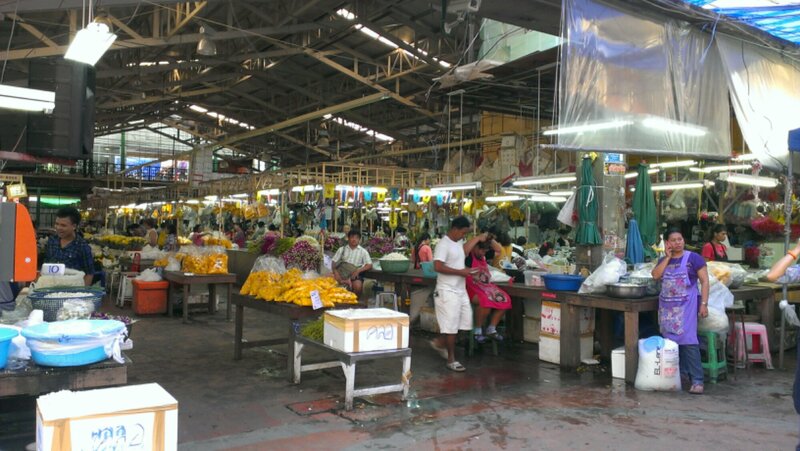 As soon we arrived Bangkok at 11am, we immediately leave our luggage in the hotel and went to the market which every Friday is wholesale day. There are good and bad to go on the wholesale day. The good side, there were so much less people especially tourists. The down side was most of the garment shops were closed. 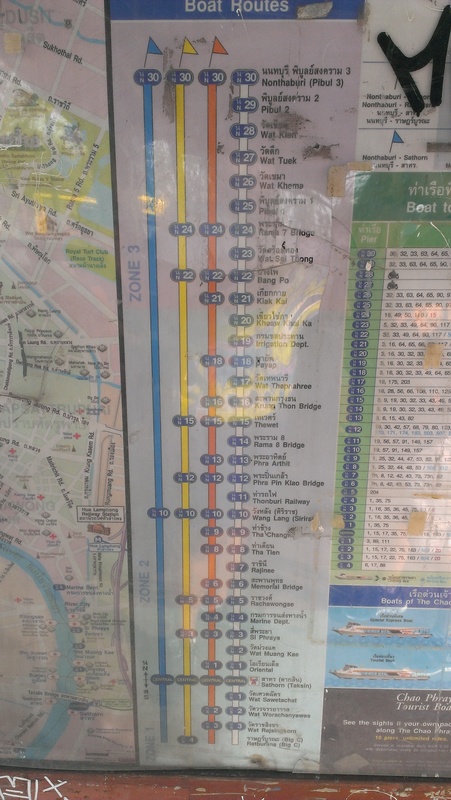 There are two MRT stations or known as BTS stations to reach Chatuchak Market. 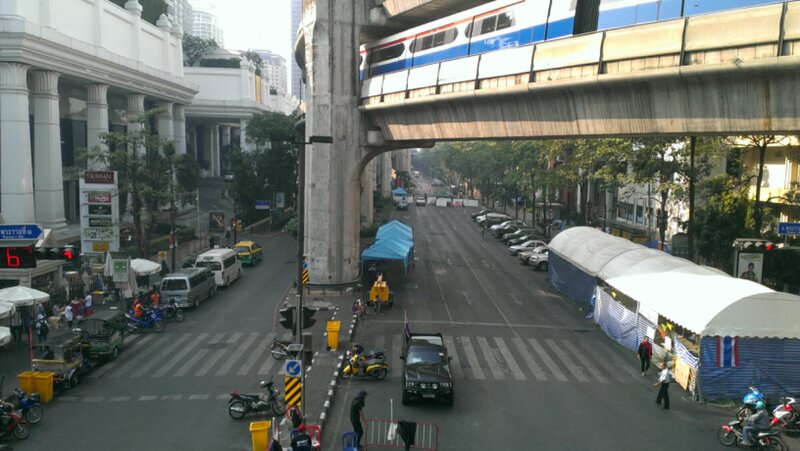 You may alight at Mo Chit BTS station and take about 5 minutes walking distance. Another option is you can change train at Mo Chit BTS to Kamphaeng Phet BTS station. 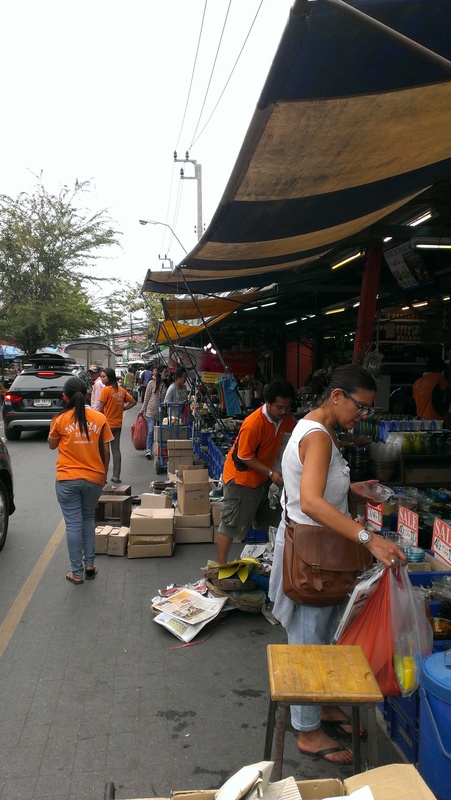 Kamphaeng Phet BTS lead you to direct entrance of Chatuchak Market. 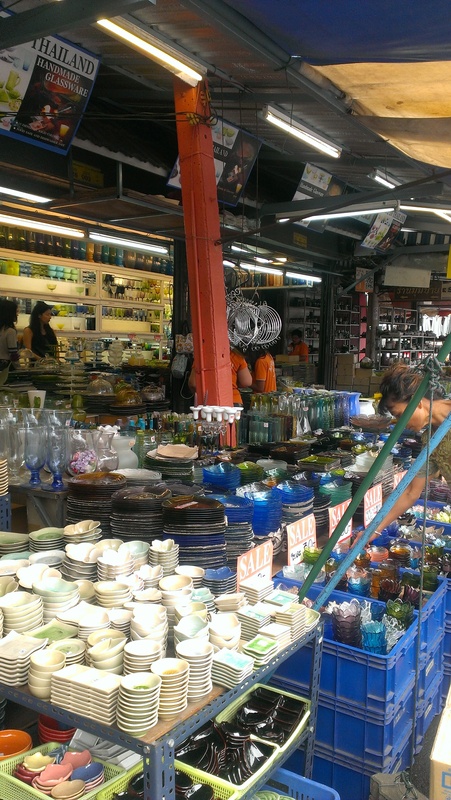 If its your first time visiting Chatuchak Market, it would be best for you to go on weekends as all shops open. Although the market opens at 6am-6pm but I would advise you to arrive at around 8-9am so that most shops open at that time. 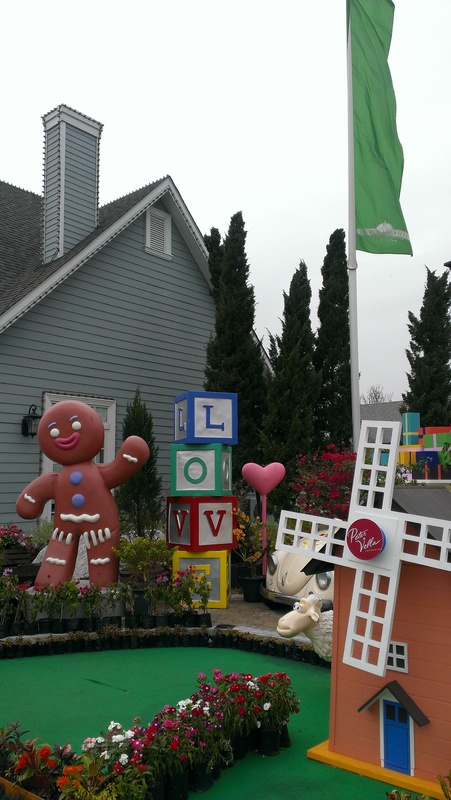 After the Chatuchak Market, we scheduled to go to Chocolate Ville (CV). CV is a theme park, No not the theme parks that there are rides available. The uniqueness of CV is it has got nothing to do with Chocolate ingredients at all. The buildings and architectures are in the oldies of American and British themes. CV operates at 4pm to 12am every day where there are many picturesque scenes for photo shooting and also a high end of dining experience (Western & Thai food). There is only one restaurant there. The restaurant tends to be very crowded, so to ensure you get a table, make sure you reserve a table one or two days before you plan to dine there. You may make reservation at CV’s facebook page. So how to get there? For us, we travelled to CV by taxi as it is the only means of transport. Outside the Mo Chit BTS there are many taxis on queue to pick up passengers. We took one of the taxis to Chocolate Ville. Make sure you have a printed Chocolate Ville map with you to show to the taxi driver. Even though they are Taxi Drivers but does not mean they know the place as the place is pretty outskirt. Also ensure when taking a taxi, ask the driver if he use meter or flat rate. Leave the taxi if he charge on flat rate. Meter charges are always cheaper than the flat rate. Our meter transport to CV cost only THB145 with 45 minutes journey include traffic jam. Of course, travelling from city centre may cost more as the location is further than Mo Chit BTS. Returning from CV may have trouble due to limited taxis available. However, not to worry, if you leave early, there shouldn’t be any problem getting a taxi. We arrived about 4:30pm and left at 8pm. We walked out to the main road and there were already 3 taxis waiting, unfortunately all charges us flat rate. A taxi driver charged us THB400 going back to Mo Chit BTS. We managed to bargain and reduce the price to THB350 which was still double rate than the meter fare. Darn! The taxi driver was quite reluctantly to reduce the price claiming there were traffic congestion which we found it was not bad after all. Therefore I would advise you to go early and leave early taxis from CV are limited. CV is not a touristic place but for locals where most of the locals travel by car. So if you are also planning to go to Chatuchak Market and Chocolate Ville, just like us, you may consider to go to Chatuchak Market in the late morning. But beware that Bangkok can be really hot in the afternoon. Make sure you wear comfortable clothes and stay hydrated. Chinatown is our next place in our itinerary. We had been to Chinatown before, it’s just that in order to go to Sampeng Lane, we need to bypass Chinatown which is along Yaowarat Road. Sampeng Lane is another wholesale market. The nearest BTS station to Chinatown is Hua Lamphong. However, we encountered “helpful” by passer twice. Once was in my first trip and now again. They volunteered to be helpful to guide lady travellers for direction even they were not been approached. Lady travellers travelling alone or two are best to ignore them as we do not know their motives. 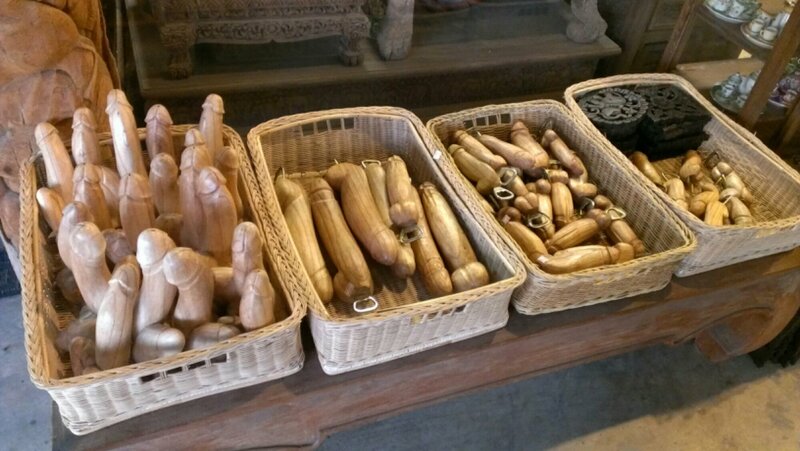 Thailand is well known with black magic. On this trip, we were approached by a security uniform man who speaks English. Though we were not harm but better be safe than sorry. If we want to ask questions, the best people to ask are staff working in 7-Eleven, those working in cafes or by passers who are youngsters. Although these people may have the difficulty to converse in English at least they do not have motives and they are genuine. Along Yaowarat road we saw they were market with crowded of people. We took a left turn. The road led us to Soi Wanit 1 Road. Retails and stalls, and fruit stalls are often seen. Walking straight along Soi Wanit 1, we finally arrived Sampeng Lane. The lane is very narrow and the retails are very near to each other. Sampeng Lane has very big crowds of locals. Human congestion! You can find many wholesale items. Make sure your belongings are safe at all times as you know pickpockets appear at crowded places. We just walked half of Sampeng Lane due to the crowd. 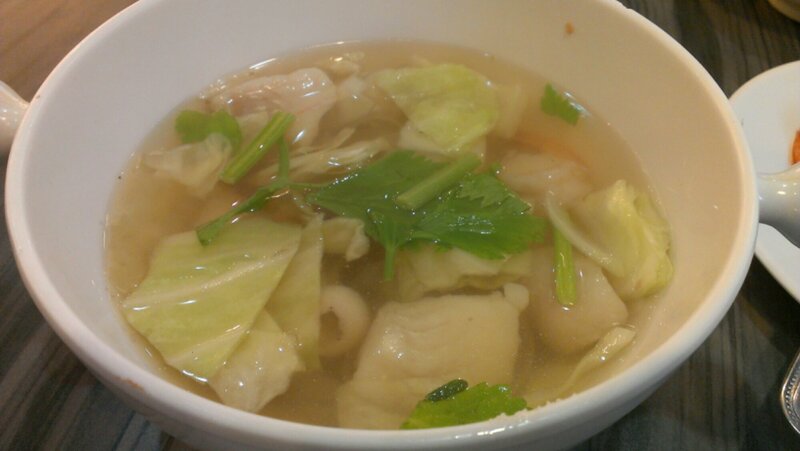 We continued to the Yaowarat Road which already the end of the Chinatown Road to have a break at KFC restaurant. 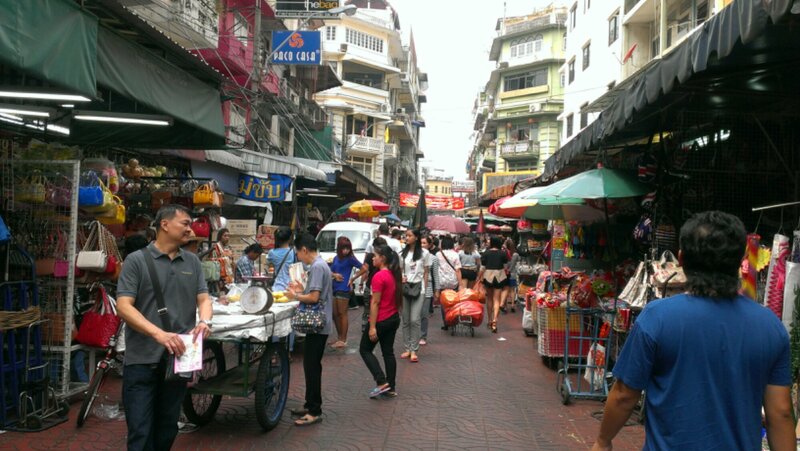 Walking further about 10 minutes from KFC, we finally arrived Pak Khlong Talat (Flower Market). We had never seen so many flowers before. 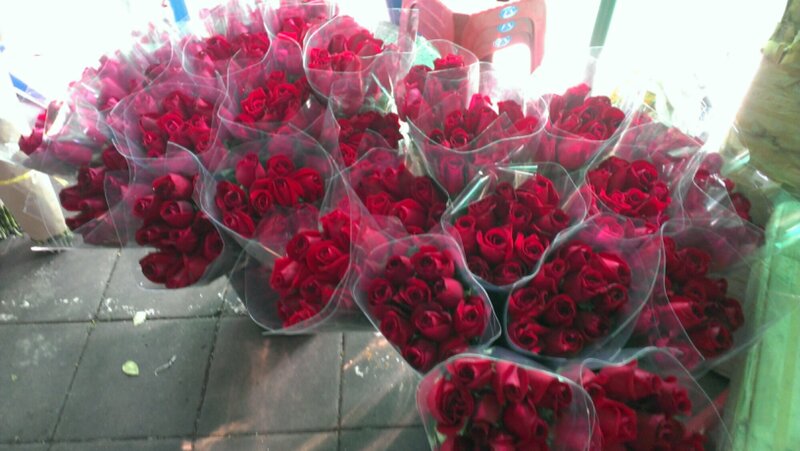 And more over the red roses were so cheap. 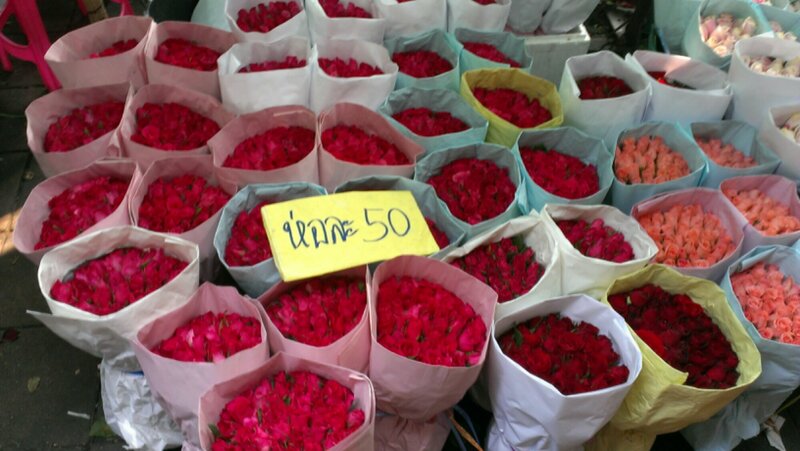 Only THB50 for two dozens of roses or maybe more. There are other flowers such as carnations, orchids and flowers for prayers. It was a great experience eventhough we did not buy any flowers. 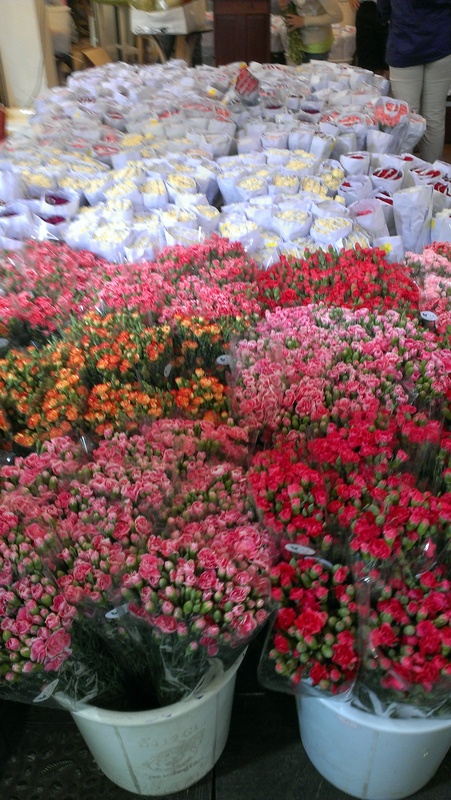 The flower market is very near to Victory Monument Pier, where we took Chao Phraya ferry ride to Sathorn Taksin Pier for to transfer to a free shuttle ferry boat to Asiatique. 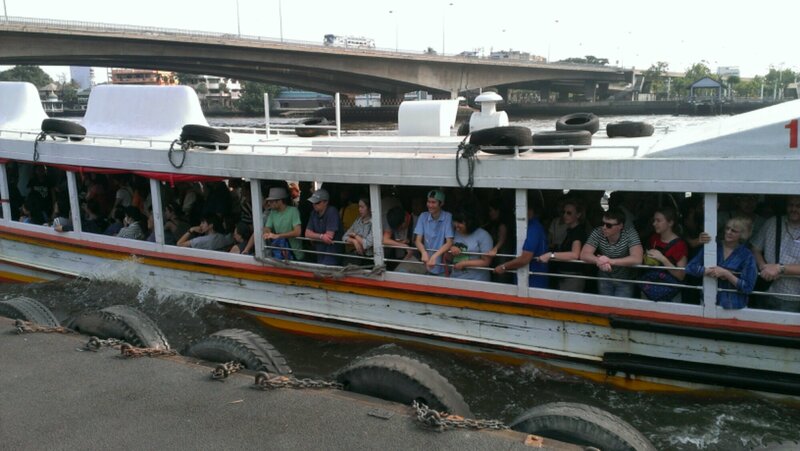 Public ferry ride on Chao Phraya river is a very convenient transportation for the tourists and as well for the locals. You may make any stops however, please beware in order to differentiate which ferry to take, people identify them on the flag colour of the ferry boat and the directions. There are green, blue, yellow and orange maybe more others. Some are tourist ferry boats. The lowest cost where the ferry stops at each Pier would be the Orange flag. Orange flag cost only THB15 per person. Just enter the ferry boat, probably you may see many people enters the boat. Arrival of the orange flag ferry boat. No worries although you do not have tickets with you. Soon you will hear a lady ferry conductor came from nowehere. She will shake her collected coins in the metal container to get your attention that she is here to collect money for tickets. The conductor could not identify whether you had already paid for tickets but this is based on thrust. Just ask how much for a ticket. Other colours of flag may skip on certain piers as some are express ferry boats. 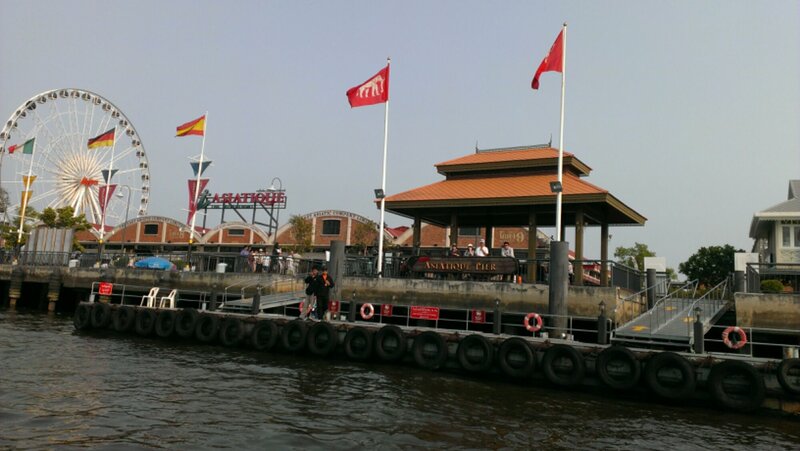 Coincidently once we arrived Sathorn Taksin Pier, the Asiatique ferry boat arrived. Need not to wait. Asiatique is a shopping mall converted from warehouses. It is a very interesting mall that it has got the similarity with the Red Brick Warehouse in Hakodate, Hokkaido where originally the buildings were used for trading but now it has converted to shopping centre. I guess Asiatique imitated the idea from Red Brick Warehouse. Do not go early because the Asiatique opens at 5pm to midnight. 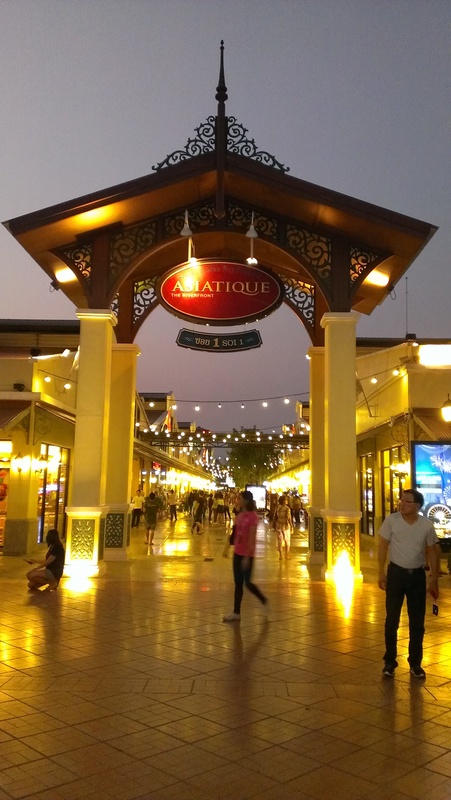 Asiatique have various shops available such as clothings, home decor items, jewellery accessories, accessories for doggies, eyewears, arts and more. 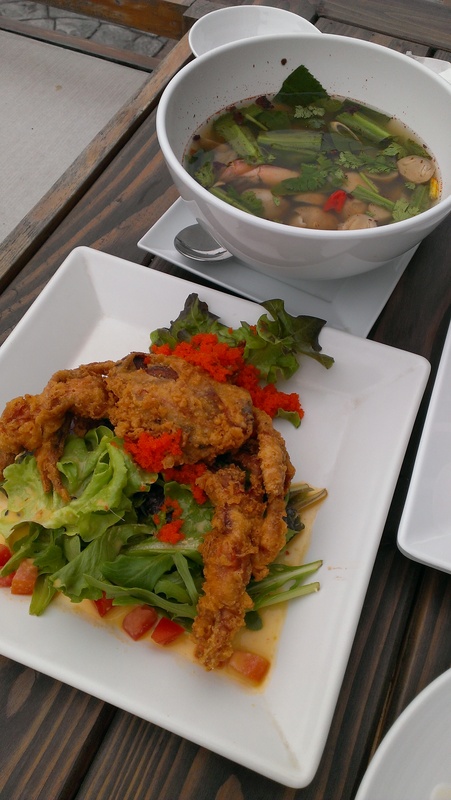 There are also many restaurants there such as Western, Thai, and Japanese cuisine. 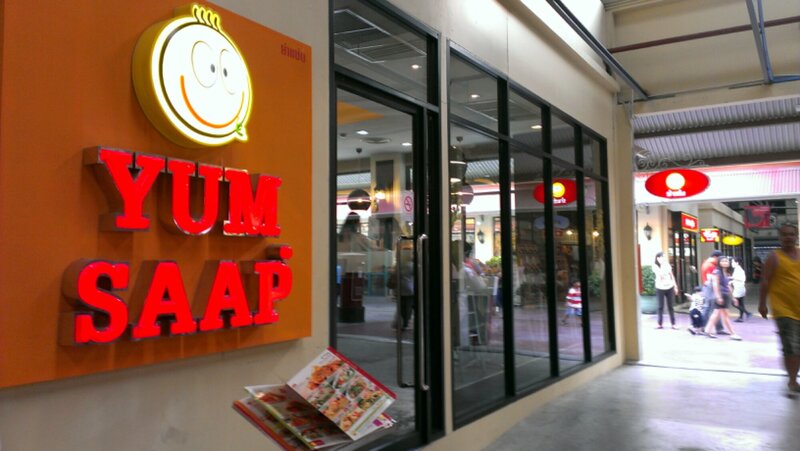 After walking and shopping for some time, since we in Thailand, we always chose Thai food – we selected a restaurant called Yum Saap. I often see this restaurant in other malls. We tried and the food was good plus the price were reasonable. To get back to the city centre, just take a return Asiatique ferry boat and back to Sathorn Taksin Pier. The Saphan Taksin BTS station is just right infront the pier. As this was our last evening to spend in Bangkok, eventhough our foots were breaking apart.. and since my watch says 8:30pm, we made a one last stop at Terminal 21. 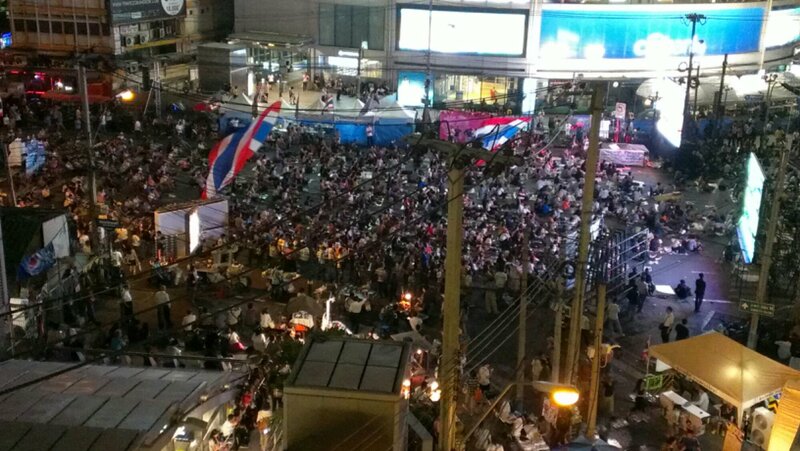 When we arrived at BTS Asok, there were big crowd of protesters seen gathering at road junction and they were watching big screen projector. Large Thailand flags were seen waving. Speech were given by one of the protester leaders. Anyway, as long they guai guai sat there and don’t make any mess,.. Bangkok is still peaceful for tourists to visit. We took an hour brief walk around the mall and we went to Gourmet Market (Lower Ground Floor) to get some snacks and also for our tomorrow’s breakfast. 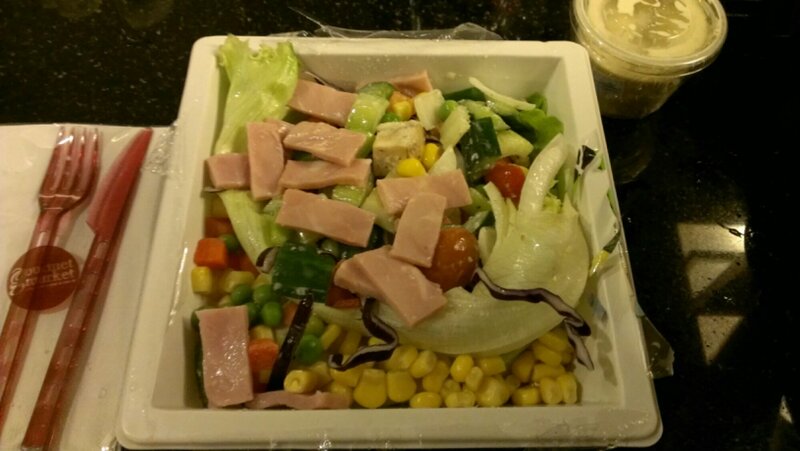 We bought salad for tomorrow’s breakfast. Well, gotta eat healthy after many heavy eatings in Bangkok. The unique of the salad, you can pick any dishes available. Once you picked the selections into a bowl, give it to a staff near the salad counter. She will weight and pack for you. If I’m not wrong, my bowl of salad was around THB100. We woke up early so we still have a bit of time to take a short walk nearby our hotel before we head to the airport. The nearest shopping mall is Emporium which that time it was yet to open. 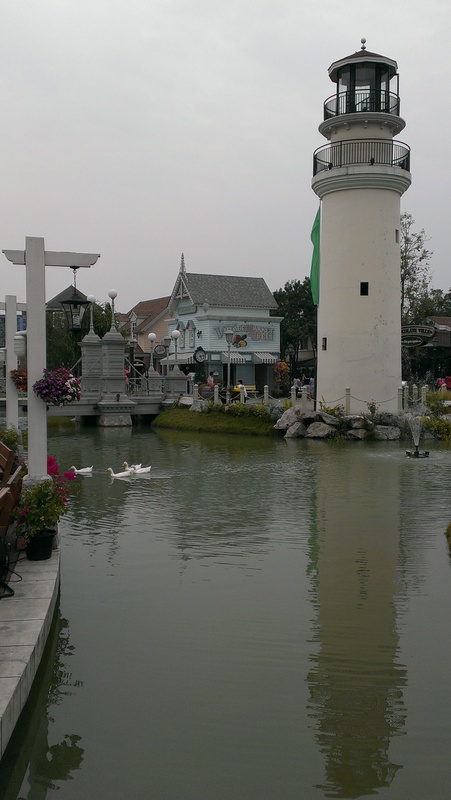 Beside the Emporium there is a park called Benjasiri Park. There were many Japanese expatriates exercise at the park. All of a sudden at that moment I felt i was in Sapporo Park. There was a large pond and the pond has got many tortoises. If you have children, do bring some breads along to feed the hungry tortoises. Just opposite the Benjasiri Park there is an American cafe called Au Bon Pain. Too bad this cafe chain is not available in Singapore and Malaysia. 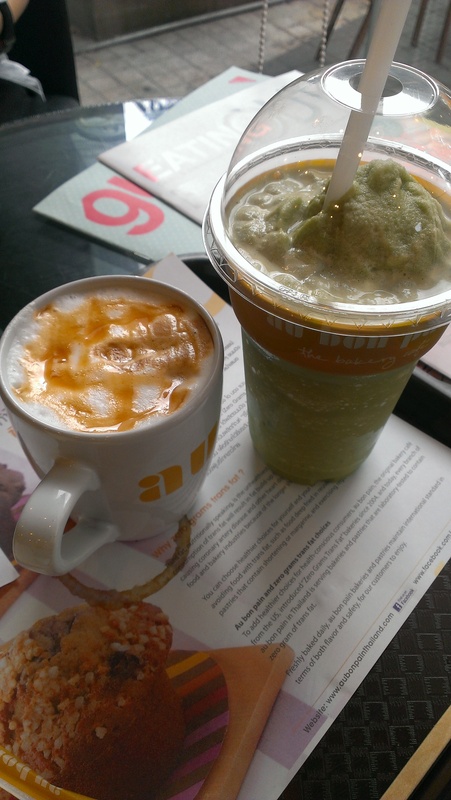 We ordered Caramel Latte and Ice Blended Green Tea. The ice-blended was good but not the Caramel Latte as it was tasteless. Anyway, you can give a try on other drinks. 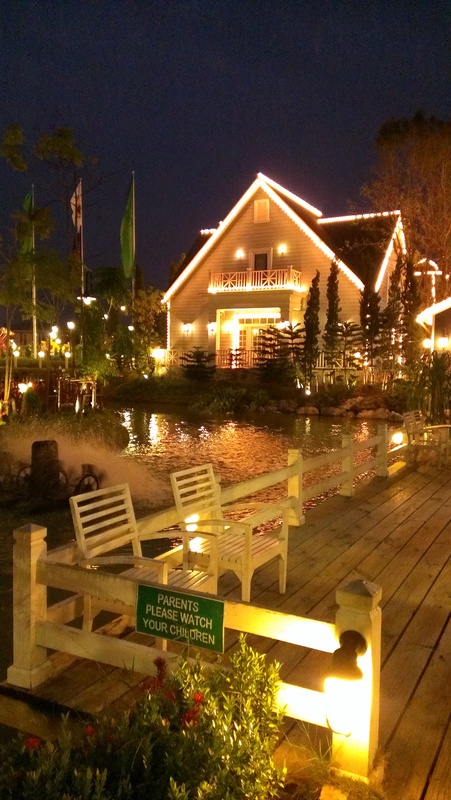 It was a full filling trip as this trip we explored some new places such as Chocolate Ville, Sampeng Lane, Soi Wanit 1 and Pak Khlong Talat (Flower Market). Will be travelling to Thailand, for a good break away from work. This is what I had planned for our trip to Thailand. Arrive Suvarnabhumi International Airport in the afternoon. Take a direct bus from the Airport to Tune Hotel, Pattaya. The hotel is situated at the North of Pattaya. We decided not to travel to Bangkok on our arrival because we do not want to bring many shopping luggages to the Pattaya. We will place after our Pattaya trip. We shall be taking Bell Travel Service where this service can be found in the Airport. The good thing about the bus service is it departs directly from the airport and to drop at the hotel! The bus journey takes about 3 hours. By the time we reach there will be approximately 7pm. At this time we shall explore not to far from our hotel. Places that near to the hotel. We shall walk to the opposite where Central Festival Pattaya where Big C department store is located, the mall is a two-storey mall that have retail shops, restaurants, cinema, boutiques and IT corner. This place will be a quickest way for us to grab our dinner. Nearby the hotel is also where Tiffany show and Alcazar show is located. There also many things to see along Soi 2, 3, 4, 5 & 6 – the night bars called Lollipop A go go? Meanwhile we also explore the Beach Road at the North of Pattaya. When walk further, towards the central of Pattaya, Hard Rock Cafe & Hotel is just around the corner. Morning breakfast!! 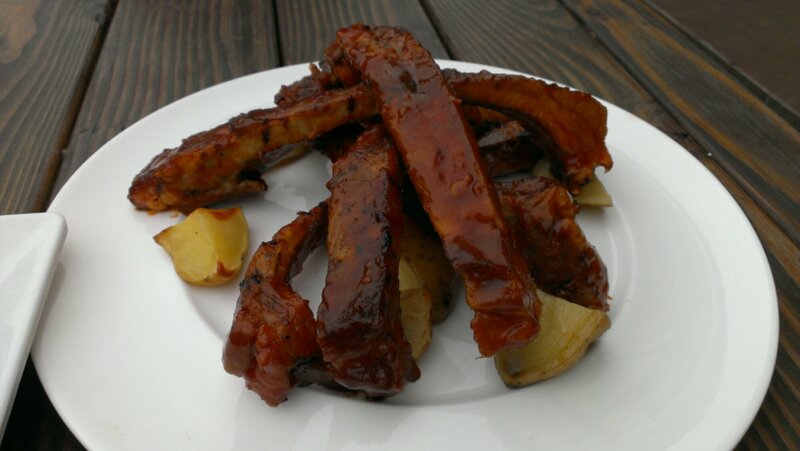 Greg’s Kitchen serves British and International cuisine from breakfast to dinner and snacks. Opens 8.30am – 11.00pm (daily). 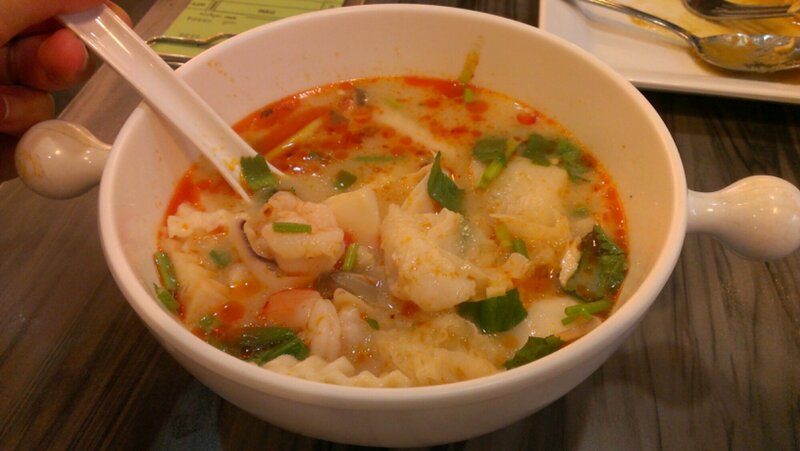 Just a short walking distance from the Tune Hotel, opposite Tiffany Show, the restaurant is just around the corner. After the hearty breakfast, it feels good to have a slow walk along the Beach Road. This allow us to see the true Pattaya. The sand, the wave, birds, shops along,..going to be a very nice feeling! I can imagine! 😀 The walk is heading to the Central Plaza, located at the Central of Pattaya, along the Beach Road. Next to the plaza, is the Royal Garden Shopping Plaza. Ripley’s Believe It or Not Museum is just in the Plaza. The two shopping malls would allow us to spend the whole morning and afternoon. Certainly lunch will be in the mall. In the late afternoon, we should be getting some fresh air instead of staying indoor during the days (though outside is going to be HOT!). Getting a taxi at Pattaya would be easy. In Pattaya they don’t call them taxi, they called it Songthaews. Basically they are trucks open backed with narrow padded benches. They make a good public transport to visit the Big Buddha Hill, at Jomtien. Have to make sure negotiate before taking it 10 Baht or 20 Baht per person? Where to next? Jomtien Beach. Many people says that the beach and water is cleaner than Pattaya Beach. Or should I say less dirty than Pattaya Beach? haha…Less prostitutes, less tourists, less crowd, less gogo bars – and more like relaxation place and a paradise for family. Well it is a good idea to check it out in the afternoon for a short visit there as Pattaya city usually more happening in the evening than the day! Have a stroll along the beach. Should get off once the sun starts to set as we a better place for dinner at Pattaya City. 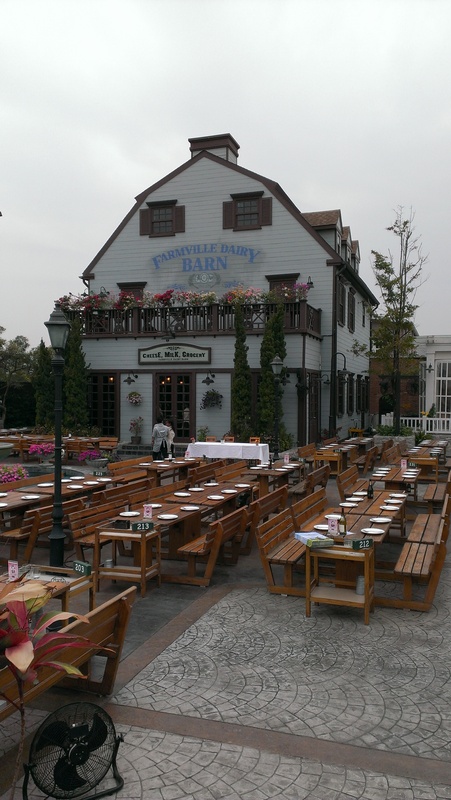 Pattaya Beer Garden is the place where I want to go for dinner. After dinner, we shall get back to our exploration of Pattaya City. This round we begin from the south Pattaya to north.. and to walk all the way back to our hotel. At the south of Pattaya, Walking Street is popular known there. We can take pictures at the New Pier Harbour which is located at the same street. We will pass by the Mike Shopping Mall. On the half way back, we may stop by for a pit rest at Kiss Food & Drink. It is some sort of like a food court in Pattaya but quite a popular known to have cheap and delicious food there and 24/7! We can go back to the Shopping Malls that we had passed by this afternoon. If not we can direct back to our Hotel for charging our batteries for BANGKOK BANGKOK here we come! Probably we may have to go to the same place for breakfast, but who knows on the day we may have found somewhere better. It takes about 3 hours to reach Bangkok. Hence, if there is even earlier bus, we would have taken that slot, unfortunately,this is the earliest bus schedule from Bell Travel Service. The hotel that we booked in Bangkok is Legacy Express. This hotel will be our first time staying in. I like the strategic and central location of the city and the hotel rate is in affordable value. To me, unless you have the money- cha-ching!, staying in Bangkok does not need 4-5 stars rating. Because the time we spend on the outside are longer than in the hotel. To me, I go for hotels that are not pricey, but value, clean, good location and of course comfortable. That’s why it takes awhile for me to find good hotel. I guess by the time we reach the hotel, it will be already 12-1pm. Not to forget the traffic jam there! 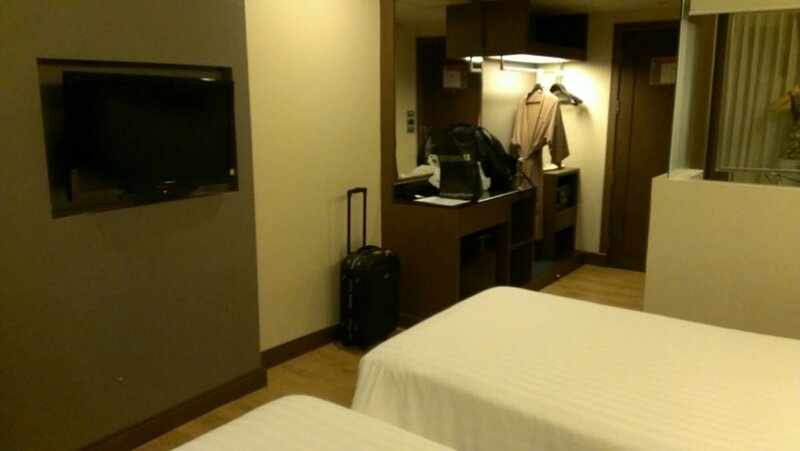 After for a while rest in the hotel, we should start our new place of adventure, Bangkok! Erawan Shrine will be our first stop. From the hotel to the Shrine isn’t far which is approx. 1.4km. If it is hot and sunny, we shall take a train from BTS Ploen Chit to BTS Chit Lom (just 1 station away). After for some worship prayer at the shrine, we should drop by Gaysorn Plaza and further down, Central World Plaza, Siam Paragon and MBK of the same road. We should pay a visit at the MBK food court as the food court is the largest in Bangkok and is recommended to dine for the variety of food. 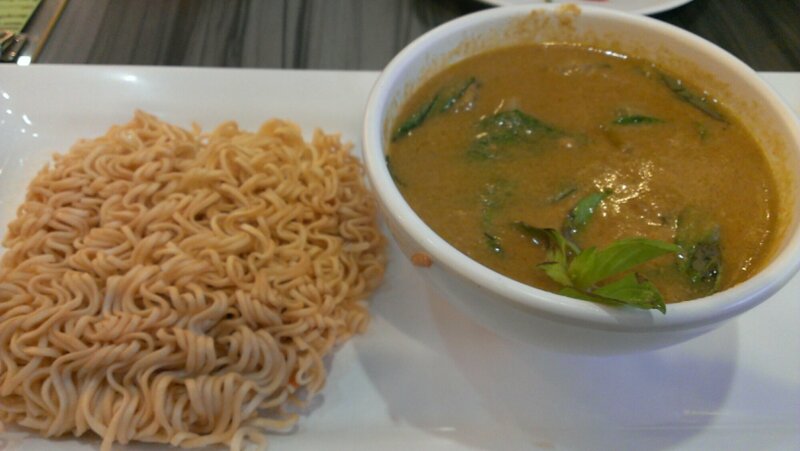 In fact many websites I have read, they would recommend to dine at food court because it is cheap, clean, yummy and serve thai authentic food. On the return, we shall head back to our hotel by taking 501 direct bus to our hotel. 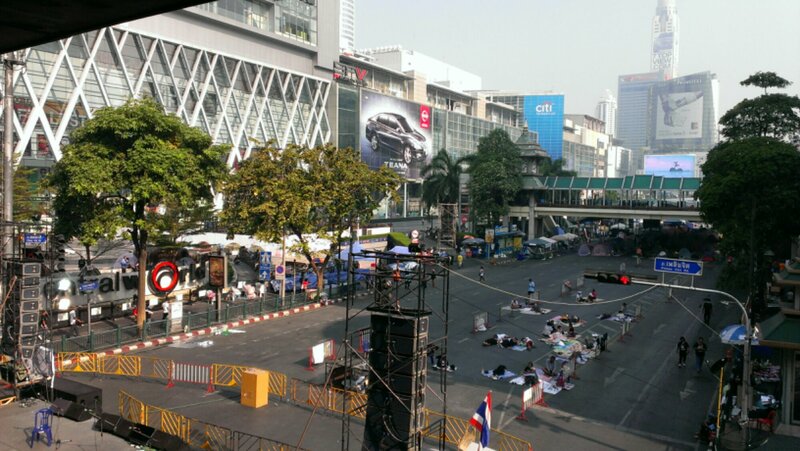 If we still have time, we can go to the Terminal 21 which is just a long our hotel street (Thanon Sukhumvit). The mall was opened in October 2011. Should still be considered fairly new. The mall is conveniently located opposite the MRT station of BTS Asok. Another day of adventure in Bangkok! Light breakfast nearby our hotel before we go to the next destination in Bangkok. Chinatown is where we are going to. Nearest MRT station is Hualamphong Station. Not far from the station is there a temple, Wat Traimit a.k.a. Golden Buddha. After the visit, we shall walk along Thanon Yaowarat/Yaowarat Road – street of Chinatown. We will have a eating stop at the Canton House – a dim sum restaurant. Opens at 11am-10pm, daily. The street is complete with chinese restaurants, budget to midrange. Noodles, tom yam, peking ducks, bird nest and etc. Reclining Buddha (Wat Pho) is one of the largest and the oldest in wats in Bangkok, with many thousands of Buddha images. Just across the Chao Praya river, Wat Arun is just the opposite. Make a trip there as well by taking ferry. Return to the same pier after the visit, and head to the Grand Palace and the Emerald Buddha Temple. The palace was an official king of Siam residence and the Emerald Buddha Temple was the chapel for the royal. Interesting. 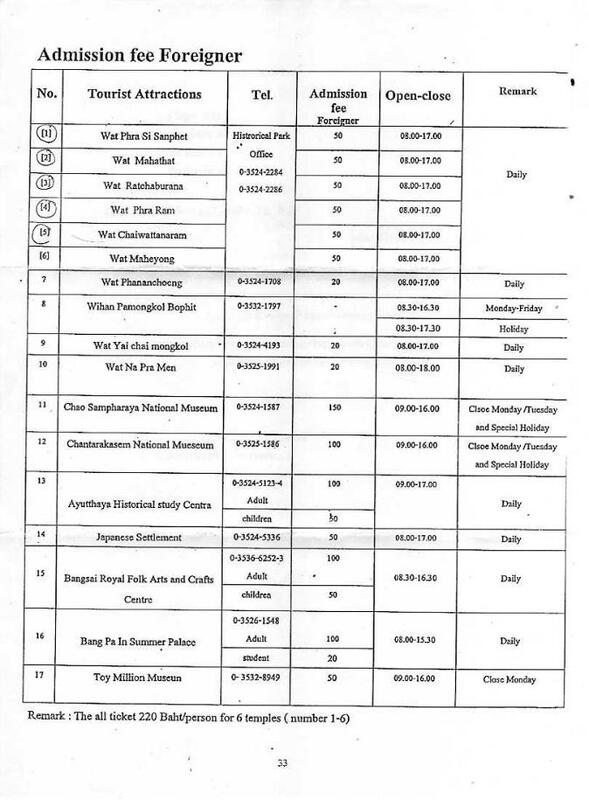 Hopefully by 5pm we have completed our routes of all Wats and Temples. 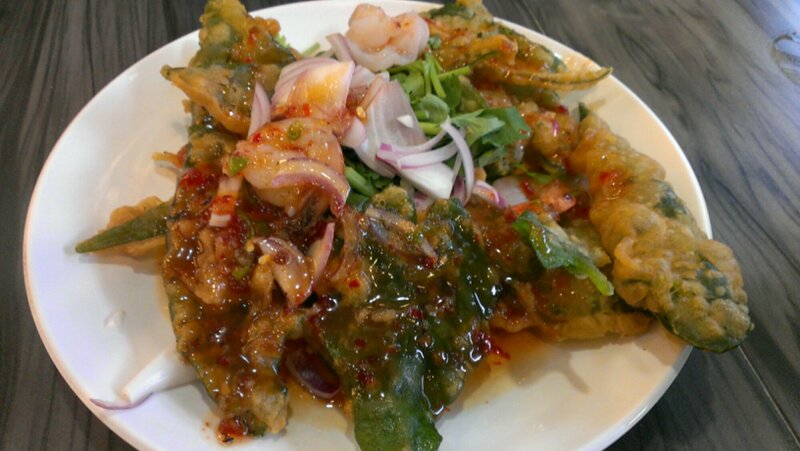 We will not be visiting Khao San Road as I read many negative reviews about the place. I had read similar reviews says the street is loud, noisy, dirty, drunkers place, and expensive place for shopping. Well, if you are a drinker and looking for budget beers, this may be a place for you. 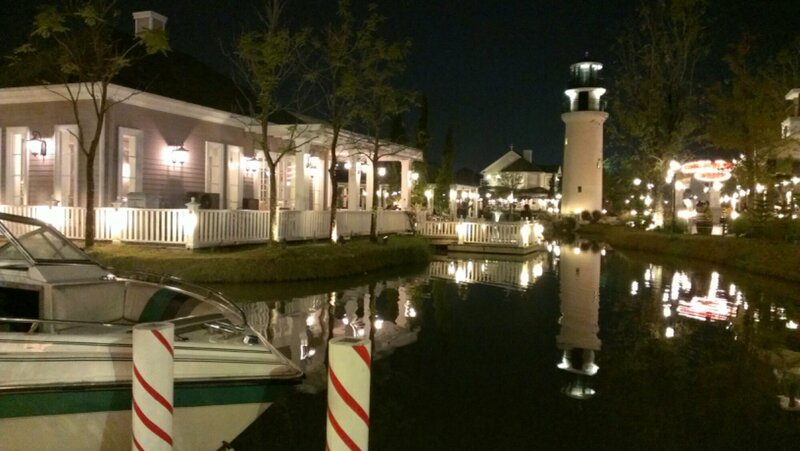 Instead of Khao San Road where I initially was planning to go, I decided to plan the following place after the Emerald Buddha Temple to Asiatique, The Riverfront. It is a new attraction for the locals and shoppers! In fact it is actually a new version of Suan Lum Night Bazaar, modern and stylish way for people to shop! We should explore to other new places which is happening in Bangkok and instead visiting the touristy places. Right? 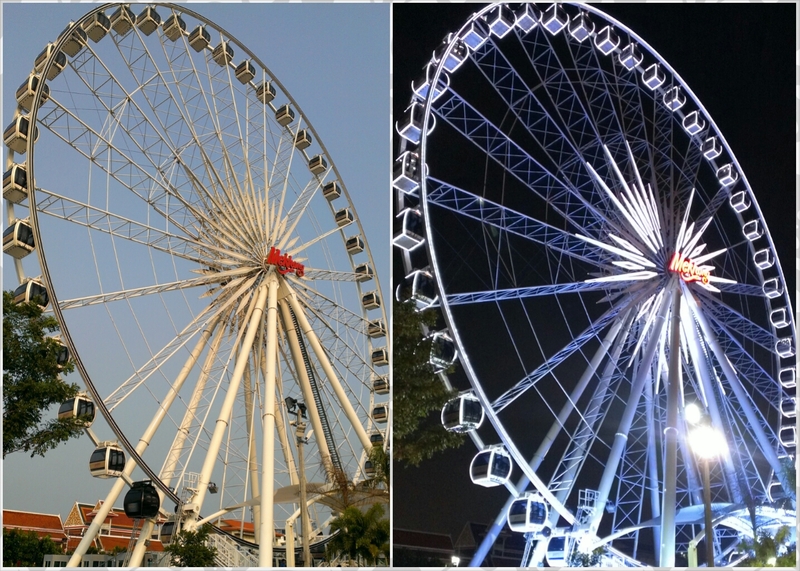 Well, Asiatique was opened in end of April 2012 and I hope most of the retails there are opened for business now. From Tha Chang Pier, to Central Pier known as Sathorn (nearest MRT station Saphan Taksin) – less stops of piers in between will be the green flag boats. Refer the boat routes and stops here. And then from the Sathorn, we shall wait for the free service boat to Asiatique. We shall be staying there for the rest of the day as there are so much more things to see, shop and dine. Looking forward to it! To return to our hotel, we shall be taking the Asiatique free service boat to Sathorn and from there, walking distance to Saphan Taksin MRT station and all the way back to BTS Ploen Chit. If we have time, we can make stop at the red light district, Patphong. Nearest BTS station is Dusit Thani. Plan for today is taking a train experience from Bangkok to Ayutthaya. Try to leave the hotel earliest in the morning and take MRT train to Bangkok Centre for Hua Lamphong Railway Station. Train leaves from almost every hour and tickets can be purchase on the spot at the railway station. Duration to the destination is 1 hour 45 minutes ride. 3rd class seats and that only cost 15 baht! The popular transport for visiting the sites of attractions at Ayutthaya Historical Park is bicycle. Yes…Like like like! Bicycle for rental services can be seen just outside the Ayutthaya train station and guess how much it cost for a bike? 30baht a day! Hmm… never know that we need to pay to visit the sites at Ayutthaya.. Need entrance tickets to go in? We should have lunch at the Ayutthaya before heading back to Bangkok by train. Recommended restaurant to go Coffee Old City which is the No.1 restaurant to eat referring to the tripadvisor and I find it is also good location, within the area of Ayutthaya city centre. Hopefully we able to leave Ayutthaya by 12noon as we have more places to visit and shopping at Bangkok. Yea.. Last minute shopping! When we arrived, we shall proceed walking to the MBK Center. Then we head to the Petchaburi Road to Pratunam Market. 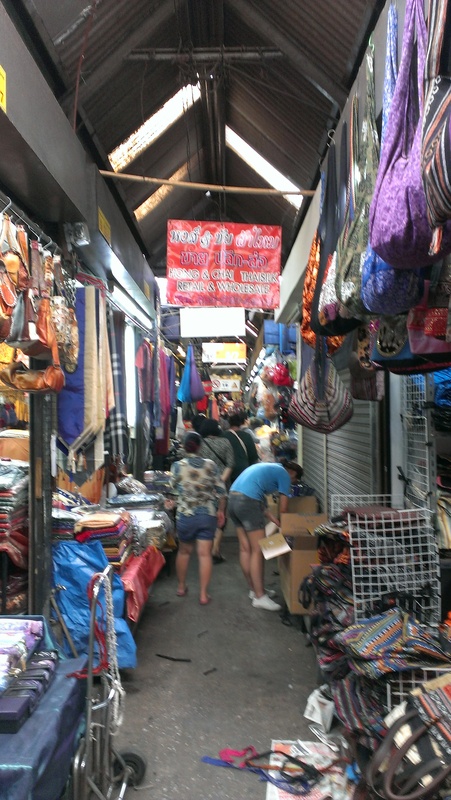 Pratunam Market is a place sells various products in wholesale price. As today is the 2nd last day for us in Thailand, we shall visit and to go wherever place we want to go again or have missed at the Thanon Rama 1 and Thanon Sukhumvit. Not much time to walk further. From our train station BTS Phloen Chit, make an interchange at BTS Phaya Thai for SA City Line train to the Suvarnabhumi Airport.